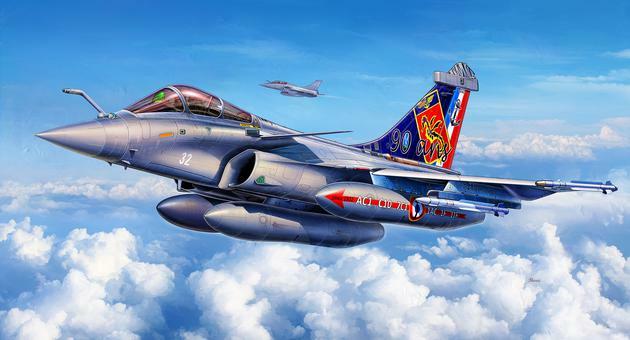 I think that Rafale is a stunning looking aircraft. 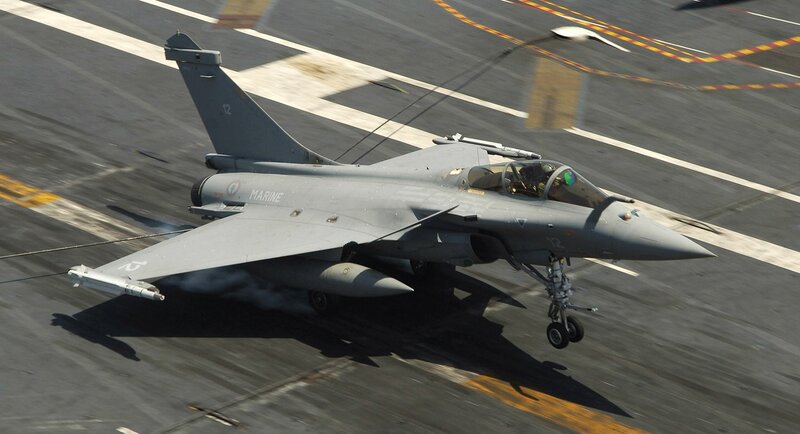 So far, the jet is operational with the French Air Force and Navy, but deals are expected with India, Qatar and United Arab Emirates for a total of 238 aircraft. The multi-role fighter has a very distinctive profile and from what I’ve seen during airshows, is highly manoeuvrable! 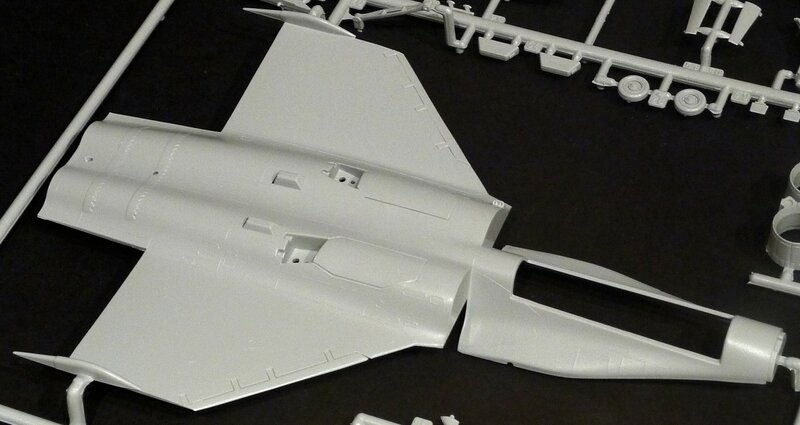 Quite a few kits of this jet are around, not in the least thanks to Revell. The 1/48 kit of the M and two-seat version was absolutely fantastic and the one in 1/144nd was also a little gem. 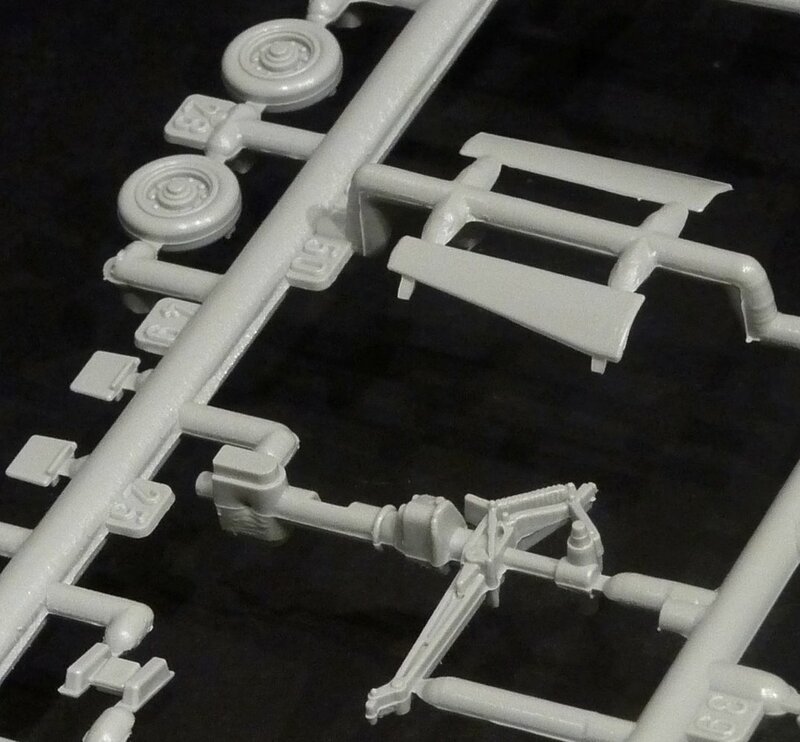 This new release in 1/72 fills the gap, even if it isn’t a new tool kit. 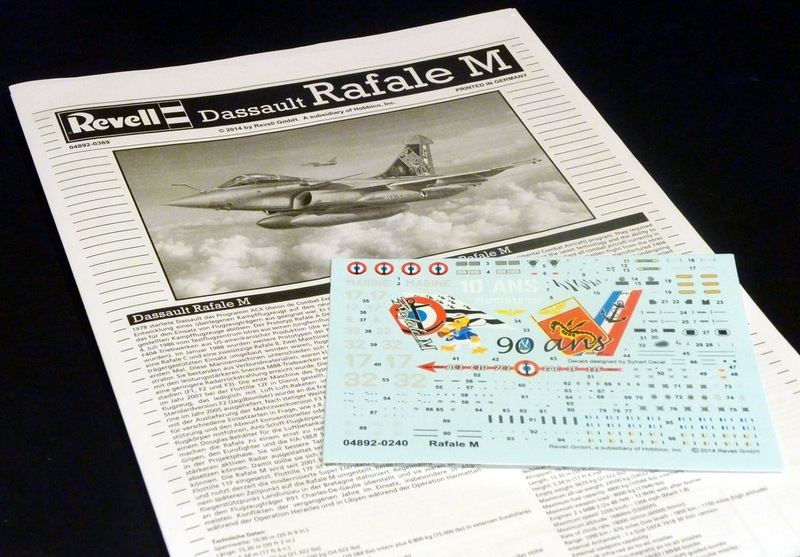 This kit is actually a re-box of the Italeri Rafale M-kit that was first edited twenty or so years ago. The kit is quite accurate when it comes to shape, but it doesn’t have recessed panel lines like it's brothers in 1/48 and 1/144. 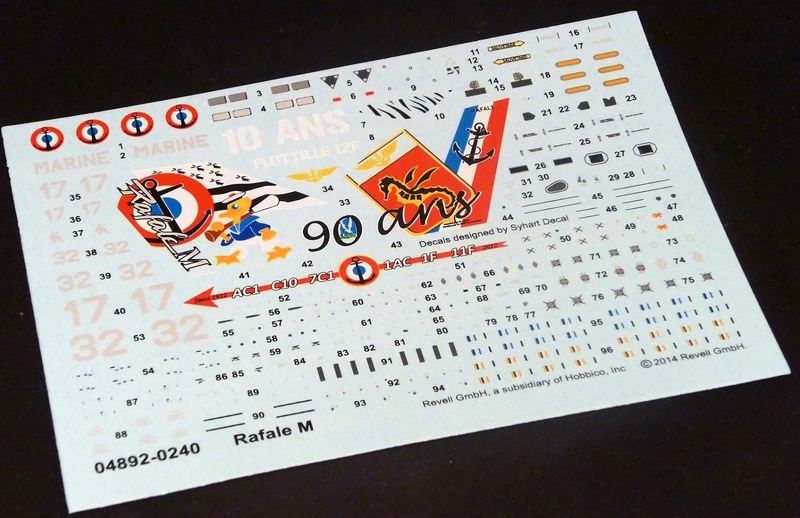 New in this kit are the very colourful decals, designed by Syhart Decal of France, for two aircraft. One is a plain “low-viz” aircraft of Flottille 12F in 2011, the other a very cool-looking jet with a special tail, commemorating the 90th anniversary of 11F and 10 years of Rafale 12F. The decals are really nicely printed and if they handle like all the other Revell decals I’ve used, they will do just fine on the model! Here’s the box art's real machine in it’s full colours. Pretty good choice if you ask me! Construction could hardly be simpler, which makes this a good kit for beginners or for any modeller who wants a quick-something-in-between. 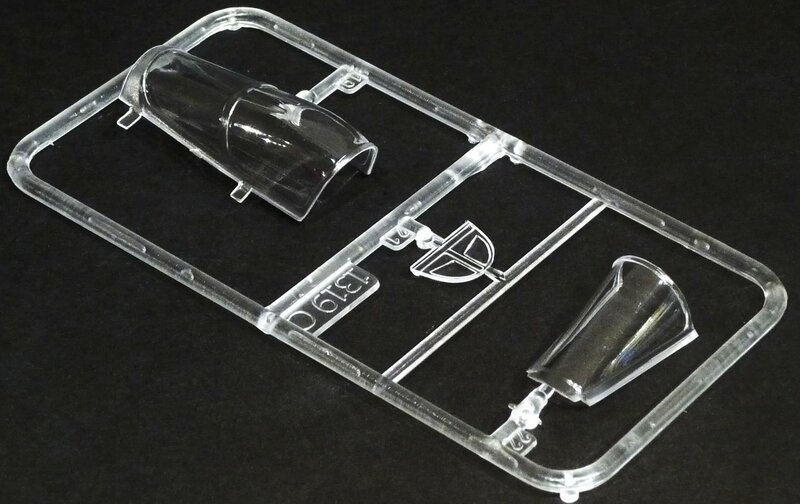 There are however a few things that you have to take care of with this kit. The cockpit is a little shallow and because of this, the ejection seat looks odd, especially on the seat. It will need some work to get this sorted out, but it’s worth your time. Don’t forget to add weight in the nose of the kit; if you don’t you’ll have a tail-sitter for sure! 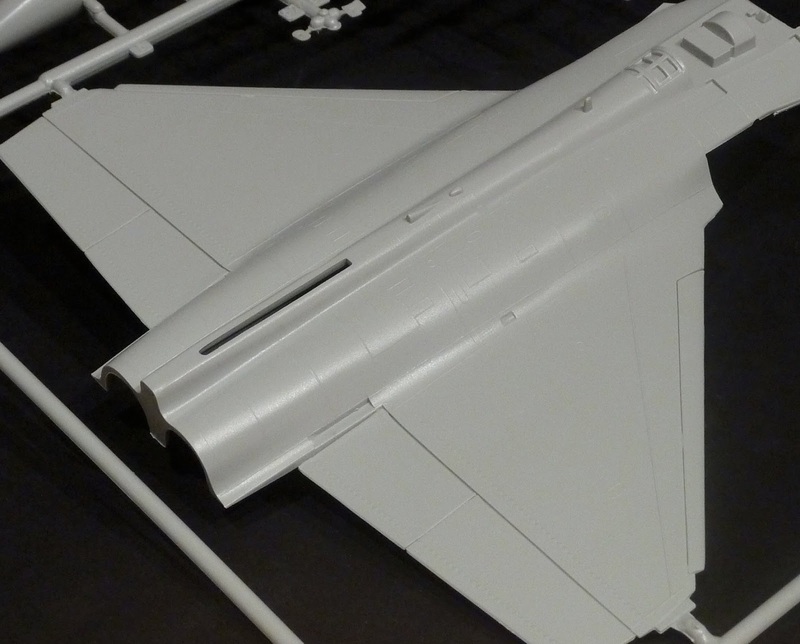 The wings and fuselage are two parts, so that makes this Rafale quite easy to build. The panel lines on these parts are raised. 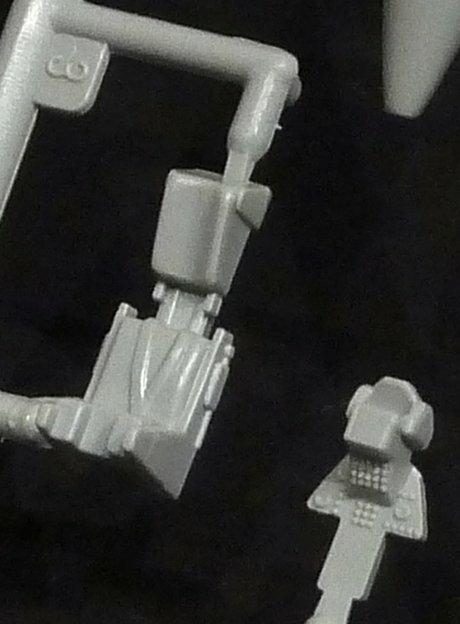 Considering the age of the moulds, there isn’t a lot of flash on the sprues – only a couple of parts need to be cleaned up. The proportions of the ejection seat are a little odd. 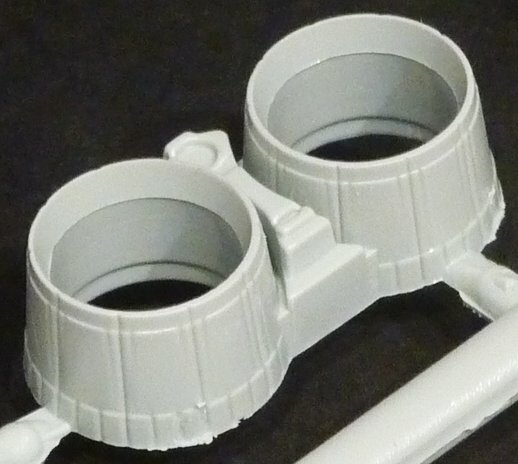 This is probably because the cockpit is too shallow... With some careful painting the instrument panel will look okay, but for those who want, some extra detail can easily be added. The vertical tail and the cockpit tub. One of the most prominent features of the Rafale M is its heavy nose gear. I like the contrast between the sleek lines of the aircraft and the heavy duty landing gear a lot. The nose gear isn’t bad, but it needs to be cleaned up and I think it can use some extra detail. Now, this is me and I’m incapable of building a kit out-of-the-box. The underside of the fuselage and wings have the main gear incorporated. The gear doors are always closed, so only inserts for the main gear are provided. Quick and easy! The canopy is nicely represented and fits perfectly on the cockpit: something that is not the case with all kits. 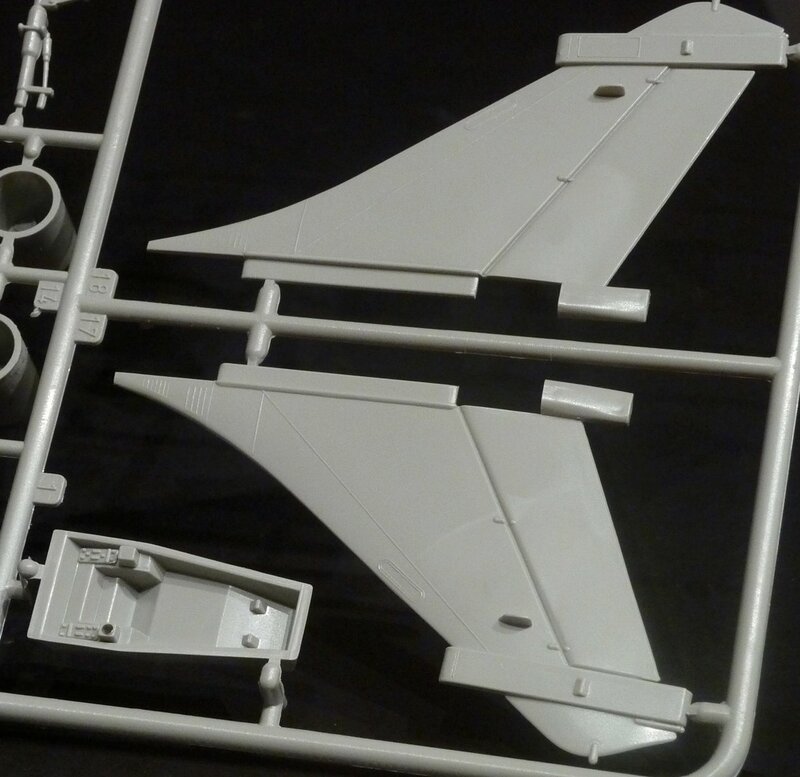 Verdict on this re-box by Revell: with the wings and fuselage being only two parts and a one-colour camouflage to be painted, I reckon this kit can be done in about a weekend. The decals are very nicely done and extremely detailed, but then again: all the work of Sylvain from Syhart Decal is. Nice and quick: really motivating modelling, right? 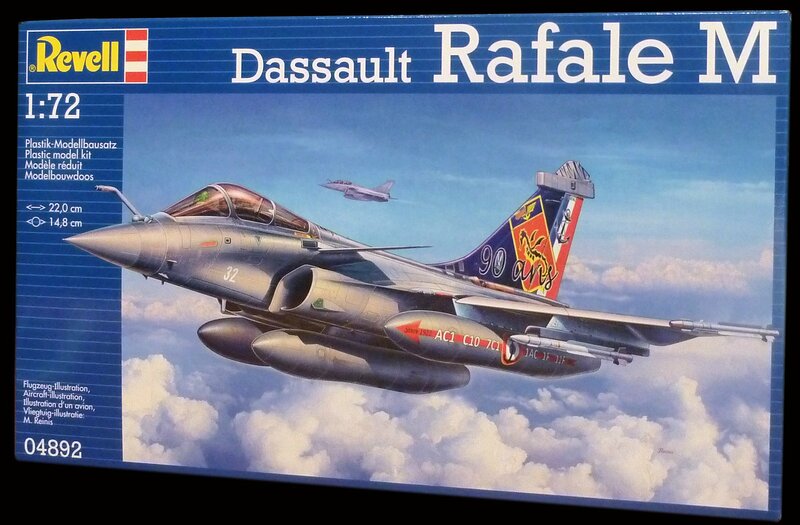 Now, I’m not supposed to use this website for special requests, but with a Revell Rafale in almost every scale, there is just one scale missing... 1/32. 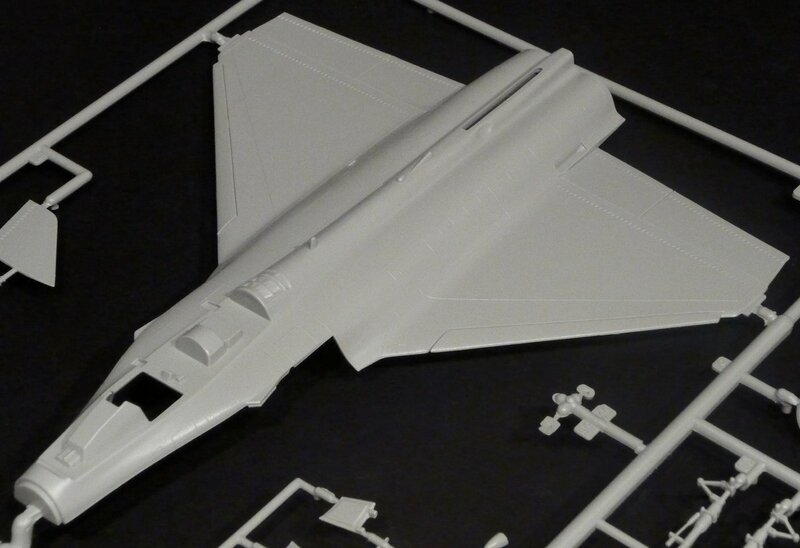 Probably a long shot, but wouldn’t a big scale Revell Rafale not be so nice...? There, I said it! 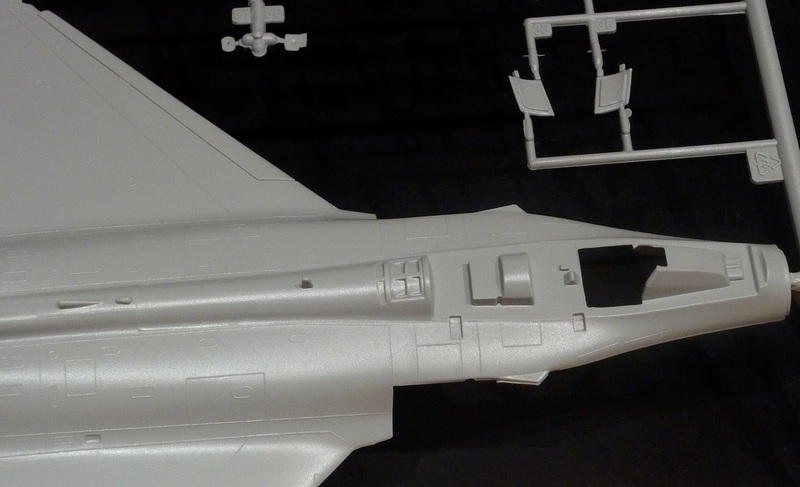 Thanks to Revell for sending us a sample of this 1/72 scale Rafale M!